​Monteverdi’s 1610 Vespers is one of the landmarks of the early Baroque, and one of the most beloved of early-music masterworks. The Vespers music is for an unspecified Marian feast, and can be adapted to fit several liturgies. We present Monteverdi’s spectacular music (along with instrumental interludes and the appropriate chant) in the context of Second Vespers for the Presentation of Mary in the Temple. 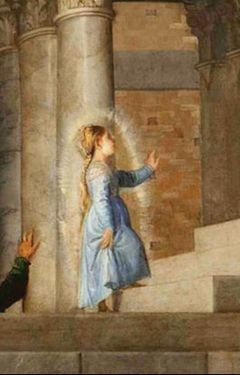 This joyous feast celebrates a legend from Mary’s childhood, in which the young girl bravely enters the temple to be brought up and educated for her role.